Today, taking advantage of the fast speed internet in KL, I took half of the morning to beef up a new blog dedicated to the Kambatik garden in Kuching. This blog compiles my earlier stories and images of the Kuching garden that could trace the development of the Malaysian garden project in Kuching. The blog url is http://kambatikgardenkch.blogspot.my/ . Happy visiting the garden. Came back to Kuching on the 29th of March ( the second time this month) for a short stay before embarking on a journey to KL. Checking out the garden I noticed that the grounds are wet and this has been especially so for the last month. It seemed that despite the drought in Peninsular states resulting in water shortage, Sarawak especially Kuching has had no similar nasty experience the first three months of the year. A short walkabout found the common wildlife are still there - birds, grasshoppers and dragonflies. The Brown-throated Sunbird was seen piercing at the base of the Bignonia magnifica flower to have direct access to its nectar. The Chestnut Munia are easily spotted throughout the day as they busy making their homes in the garden especially at the bamboo clump. Finally the typical Kuching bird - the Pied Triller was at the Tabebuia rosea tree perching briefly as if to greet me on my return. Staying close to nature is my favourite pastime. There are many side interests that enhance this experience like a hobby in wildlife photography, birding, painting, bloom hunting and gardening. It does not matter whether you have a tiny plot of land in your urban house setting or a large space to work with. There are ways to attract wildlife in all its diversity to call your garden home. Don't worry excessively about climate change. since this is a global phenomena that only your government can attempt to solve on G2G basis. Do your little bit to solve the biodiversity issues by using your hands to create a little green eden around your immediate surrounding - your tiny spot in this big blue planet. We can act as an individual to act on protecting biodiversity by having a garden space around where we sleep before the night curtains fall. And when the morning breaks, go step outside the garden and enjoy the fresh air and leaves to refresh your eyes. This is what is relevant at the local level , you as an individual can do to protect and encourage more wildlife and greenery in urban settings. You don't need to be a rocket scientist to solve the climate change problem. Just do what is relevant as an individual. The birds, bees and butterflies need you. If there are not around there will be no germination, no forests and clean air. So, start living naturally by letting go your green fingers. You'll be surprised to know along the way how you need the wildlife and greenery more than you could possibly imagine. Back garden - view from the kitchen. Side garden, next to car porch. The side garden next to the car porch needs thinning out. This morning after the drizzle fizzles out I started to remove some plants that have overgrown unruly by the side garden. Some of the plants have been hidden in plain sight are in need to be exposed of their characteristics to be enjoyed. The Blood Banana (Musa sumatrana) came out in dark red spots. Two varieties of the cordyline (Ti tree) showed how attractive leaves can be to enlighten the green wash. The variegated leaves come in red, cream and bronze colours. It is indeed a pleasure and beauty to the eyes to watch the Ixora coccinea bush flowering well at the front garden. There are many varieties or cultivars of this species. There are hardy flowering plants for the Laman Kambatik or the Malaysian garden. The ixoras belong to the Coffee family (Rubiaceae) and they produce lots of berries. The best thing a gardener could do is to just let the plant grow naturally without too much pruning or 'shaping' or 'boxing' it. One species that should be grown in the Kambatik garden is the Ixora javanica because this species like the open sun, grows to a moderate human height and having brilliant orange as well as red flowers. It is also easy to propagate from cuttings. Check out more plants for the Kambatik garden belonging to the Coffee family here. Large leaves of the Ong Lumok (Artocarpus odoratissimus) and purple curtains of Congea velutina. The Little Green Pigeon is beginning to adapt itself to the greenery at the garden. On many occasions during this January and February I saw a pair of these lovely birds finding comfort in the shade of the tall Ong Lumok tree (Artocarpus odoratissmus). There among the large leaves of the Ong Lumok and vines of the Congea velutina the birds hide and rest in relative safety. They are seen in the early morning and late afternoon. How I wish they start building a nest which is a good test that these wild pigeon birds if given proper habitat can also survive in town gardens. It was a very pleasant surprise this afternoon when I stumbled upon the Common Mormon. It was seen flying about the garden in slow flight movements, which is typical of the species. It hovered at the Yellow Ixora and moved about places to the heliconia leaves and many other plants in the garden. When it decided to settle at the Cats Tails leaves for a brief rest a meter from where I stood, it spread out its wings to allow me a good photoshoot session. The Common Mormon is a medium-sized 'swallow tail' with black wings. Its hind wings have beautiful red marks and a unique 'tail'. Varying foliage and colours in the Kambatik garden. With flowers we sense the changing times and seasons. I like to look at a garden like viewing a pyramid. At the bottom level is the architecture, another row up is the environmental sustainability and the very top of the pyramid is pleasure. We start first by thinking from the basic building block of space planning, choice of texture, shapes and colours for these constitute the the architectural aspects of the garden. Combining the contrasting leaves forms and textures help obtain a distinctive exotic and tropical image. For instance, large or broad leaves can be combined with structural plants like palms. The flowers and foliage can recreate the feelings or mood of change of seasons. Most importantly plant trees, trees and trees because trees are the urban lungs. Columns of biomass around our house provide better micro-climatic comfort and oxygen. Without trees we have no future. Simple as that. Next in the environmental sustainability come the important denizens of the garden, principally the wildlife from the lowly earthworms to those high above the trees mainly the birds, butterflies and bees. These group of garden creatures are our "voiceless" neighbours with which we should care and collaborate with. They need us to give the freedom to build their nests, provide food (edible landscaping) and branches to preen and play. In the process the garden becomes a nature sanctuary for food, foliage and fun for the wildlife. Finally, at the top of the pyramid view is the pleasure we get from both active and passive recreation. In active mode we sweat in bodily welfare from excercise and working out in the garden. Most important is the inspiration that the garden can give us. In reflective mood we begin to find the feeling and sense of beauty of the place and nature in particular. That is it! The garden is a step into paradise. Therefore, create your own Kambatik garden. It is never too late to create paradise on earth especially if you believe that ours is a blue and green planet. A denizen of the garden - a place for food, fun and foliage cover. My visit to Kuching will not be significant if I don't see the Long-tailed Shrike in the garden here. I saw it clinging to the very tip of the terminal frond of the Carpentaria palm at the front garden just the other day. So its presence in the garden is a confirmation that this species is indeed a Kuching bird. I say this because I have not seen this bird in Bintulu, though I'm every ready for a surprise. At the back garden it seemed customary for the Oriental Magpie-robin to wake me up early every morning. Thus we are always served with melodious musical notes from morning to late afternoon. I look forward to more sightings of other Kuching birds in the garden this visit. 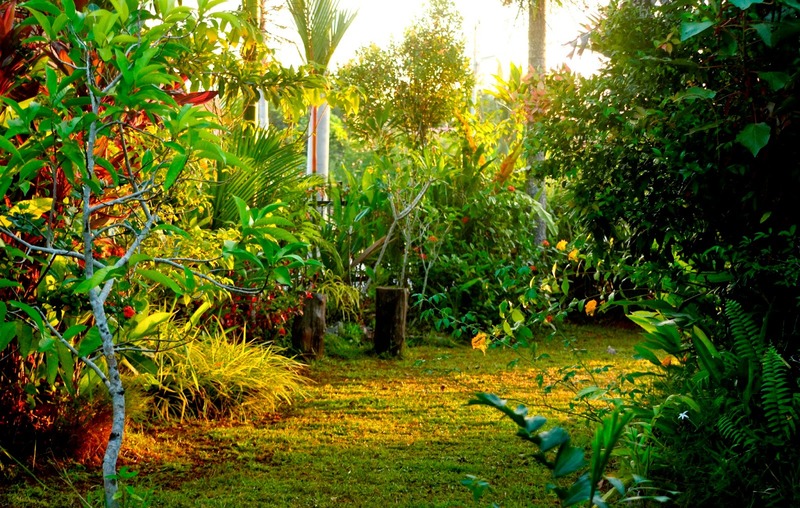 On this visit the garden looks luxurious, tropical and exotic. Swaying palms, bamboo leaves, use of broad leaves, colours from flowers, climbers and sheaths of the Red Sealing Wax palm and tall trees help make the garden cool yet colourful. The columns of greenery provides much sanctuary for wildlife especially the common garden birds here. View of side garden, looking south. Back in Kuching city. First things first. The garden grasses, shrubbery, trees and vines are a bit overgrown. More gardening work is envisaged. The main thing is to tidy up the place for we gonna stay in Kuching a pretty while on this escapade. Was pleasantly surprised to see the orchids flowering at the back garden. This species will normally keep the flowers for about two months on the stalk. Such brightness of colours are a welcome sight in any garden. Will be writing more about the Kuching garden soon. Meantime enjoy the sunset from the garden.